Quinnipiac players scream during Saturday’s meet vs. Maryland. Several Quinnipiac players flip in the air during Saturday’s meet vs. Maryland. A Quinnipiac player stumbles in the team’s acro event in Saturday’s meet vs. Maryland. Quinnipiac’s Christina Lasto smiles after completing an acro heat in Saturday’s meet vs. Maryland. Quinnipiac’s Trisha Pierce hugs one of her teammates in Saturday’s meet vs. Maryland. Quinnipiac’s Jayme Strype holds teammate Christina Lasto in one of the team’s pyramid heats in Saturday’s meet vs. Maryland. Quinnipiac head coach Mary Ann Powers claps for one of her players in Saturday’s meet vs. Maryland. Quinnipiac’s Erin Trotman holds teammate Christina Lasto in one of the team’s pyramid heats in Saturday’s meet vs. Maryland. Quinnipiac’s Danielle Burns does a flip in Saturday’s meet vs. Maryland. Quinnipiac’s Erin Trotman does a flip in Saturday’s meet vs. Maryland. Quinnipiac’s Christina Lasto is tossed in the air by her teammates in Saturday’s meet vs. Maryland. Quinnipiac’s Trisha Pierce and Christina Lasto are tossed in the air by their teammates in the toss event in Saturday’s meet vs. Maryland. Quinnipiac’s Christina Lasto does a flip in the tumbling event in Saturday’s meet vs. Maryland. Quinnipiac’s Erin Trotman hugs assistant coach Jacqueline Svadeba after one of the tumbling events in Saturday’s meet vs. Maryland. Quinnipiac players perform in the team routine in Saturday’s meet vs. Maryland. 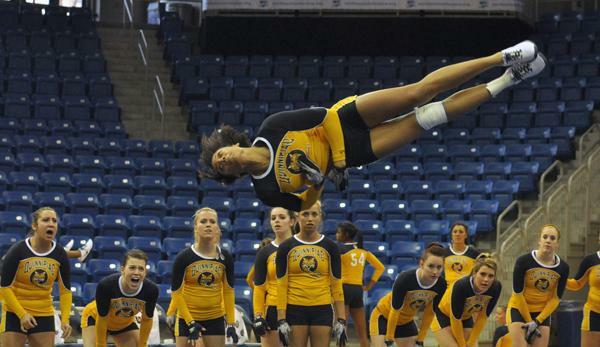 A Quinnipiac player flips in the air in the team routine in Saturday’s meet vs. Maryland.